Notes: Stokesay Castle is a fortified manor house in Stokesay, Shropshire, England. It was built in the late 13th century by Laurence of Ludlow, then the leading wool merchant in England, who intended it to form a secure private house and generate income as a commercial estate. Laurence's descendants continued to own the castle until the 16th century, when it passed through various private owners. By the time of the outbreak of the English Civil War in 1641, Stokesay was owned by William Craven, the first Earl of Craven and a supporter of King Charles I. After the Royalist war effort collapsed in 1645, Parliamentary forces besieged the castle in June and quickly forced its garrison to surrender. Parliament ordered the property to be slighted, but only minor damage was done to the walls, allowing Stokesay to continue to be used as a house by the Baldwyn family until the end of the 17th century. In the 18th century the Baldwyns rented the castle out for a range of agricultural and manufacturing purposes. It fell into disrepair, and the antiquarian John Britton noted during his visit in 1813 that it had been "abandoned to neglect, and rapidly advancing to ruin". Restoration work was carried out in the 1830s and 1850s by William Craven, the second Earl of Craven. In 1869 the Craven estate, now heavily in debt, was sold to the wealthy industrialist John Derby Allcroft who paid for another round of extensive restoration during the 1870s. Both of these owners attempted to limit any alterations to the existing buildings during their conservation work, which was unusual for this period. The castle became a popular location for tourists and artists, and was formally opened to paying visitors in 1908. Allcroft's descendants fell into financial difficulties during the early 20th century, however, and it became increasingly difficult for them to cover the costs of maintaining Stokesay. 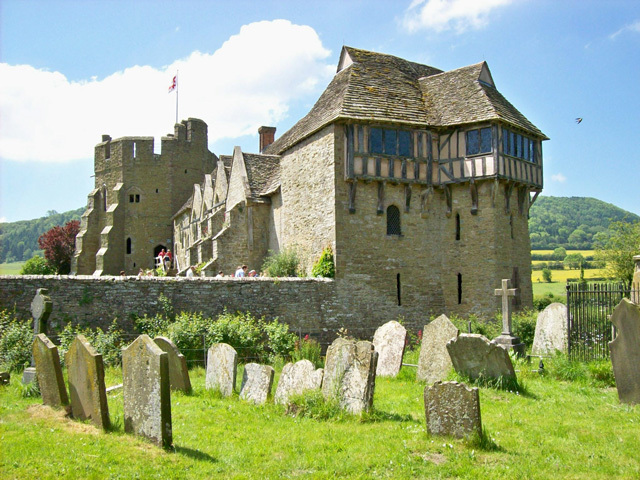 In 1986 Jewell Magnus-Allcroft finally agreed to place Stokesay Castle into the guardianship of English Heritage, and the castle was left to the organisation on her death in 1992. English Heritage carried out extensive restoration of the castle in the late 1980s. In the 21st century, Stokesay Castle continues to be operated as a tourist attraction, receiving 39,218 visitors in 2010. Architecturally, Stokesay Castle is "one of the best-preserved medieval fortified manor houses in England", according to historian Henry Summerson. The castle comprises a walled, moated enclosure, with an entrance way through a 17th-century timber and plaster gatehouse. Inside, the courtyard faces a stone hall and solar block, protected by two stone towers. The hall features a 13th-century wooden-beamed ceiling, and 17th-century carved figures ornament the gatehouse and the solar. The castle was never intended to be a serious military fortification, but its style was intended to echo the much larger castles being built by Edward I in North Wales. Originally designed as a prestigious, secure, comfortable home, the castle has changed very little since the 13th century, and is a rare, surviving example of a near complete set of medieval buildings. English Heritage has minimised the amount of interpretative material displayed at the property and kept the castle largely unfurnished.